The corvid bird family -- including the crows and jays -- have remarkable intellectual powers. 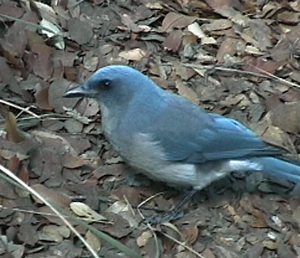 Scrub Jays are adept at concealing food in dozens of locations, and are smart enough to avoid hiding their food while another bird is watching, or to move their food if they know they have been observed. Moreover, they can remember which kind of meal they stashed. A favored food -- delectable moth larvae -- is recovered earliest. The birds ignore locations once the food has spoiled, but still remember the location for less-perishable items like peanuts. This suggests they have an "what/when/where" episode-like recall of activities that were thought only to be present in humans, as well as the ability to anticipate other's behavior. Other experiments show Jays can plan ahead. When moved around according to a daily schedule inside compartmentalized cages, after a few trials the birds learned to secrete food in locations where they were accustomed to being hungry -- even hiding favorite foods in locations where regular food was already available. My personal experience shows Jays are capable of surprising intelligence. During a camping trip, we unpacked a large pile of objects on a picnic table in Chiricahua National Park in Arizona. A wild Mexican Jay (pictured above) immediately selected the one bag containing cookies and pecked it open -- presumably recognizing the picture of a cookie on the front.